Fun fact of the day: apple trees are a member of the rose family, and are not native to North America—they spread from Asia through Europe and colonists brought them to this continent in the 1600s. There were once 1000 to 1600 varieties of apples grown in the southern and central Appalachian region, which is pretty astounding considering that they aren’t native and that Wikipedia tells us there are over 7500 cultivars of apple. As of 2011, one study suggested there were still over 600 distinct varieties grown in the region. At least two of these cultivars are special West Virginia contributions. 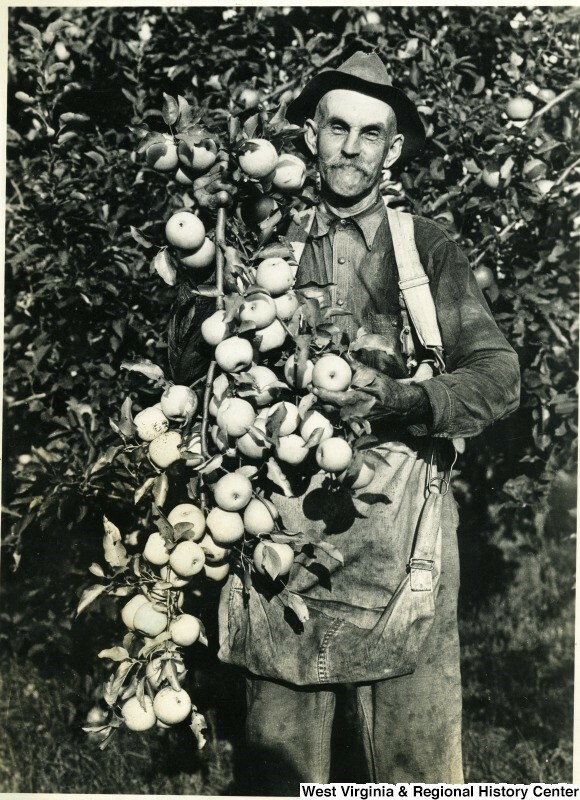 The Grimes Golden apple cultivar was discovered about 1805 on the farm of Thomas Grimes at Fowlersville near Wellsburg. It is apparently “Considered by some to be the best frying apple ever.” Following in those delicious footsteps, a chance seedling of Golden Delicious was discovered by Anderson Mullins in Clay County in 1912. It rose to become, in my humble opinion, far more delicious than Red Delicious (no relation), and the number 6 most purchased fresh apple variety in 2016. West Virginia is suitably proud of this accomplishment: legislators named the Golden Delicious the West Virginia state apple in 1995. 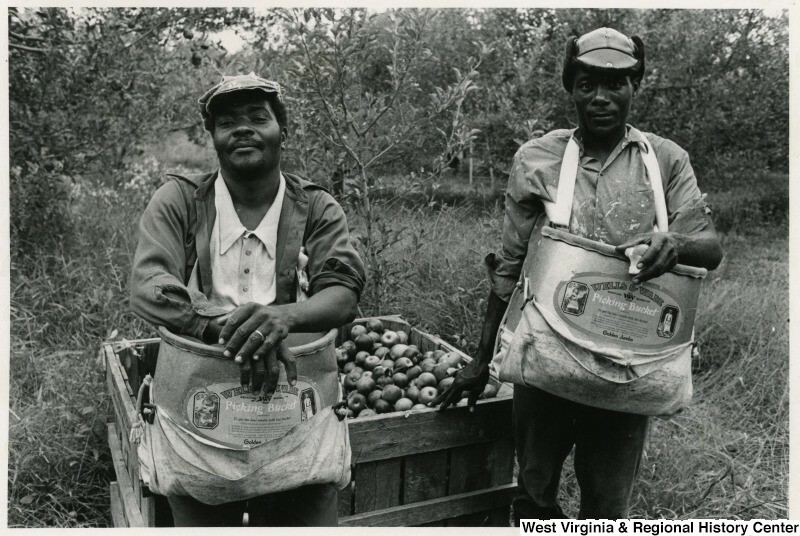 In the early 1900s, WV apples were more likely to be sold as fresh fruit. By 1955, apple crops sales in Appalachia were roughly divided 50/50 between fresh and processed apples. Now, only around 20% of the state’s apples are sold as fresh fruit. (I don’t have any data on what the processed apples become, but I’m hoping that many of them go toward making cider). Some of this change in the final disposition of our apples may have to do with a change in tastes: in 1912, apple consumption in the US was 74 lbs. per person, and by 1969 the per person consumption was down to 12 lbs. Researchers affiliated with WVU’s Agricultural Experiment Station have done studies to investigate why consumption is changing, if you’re interested in reading up on that. 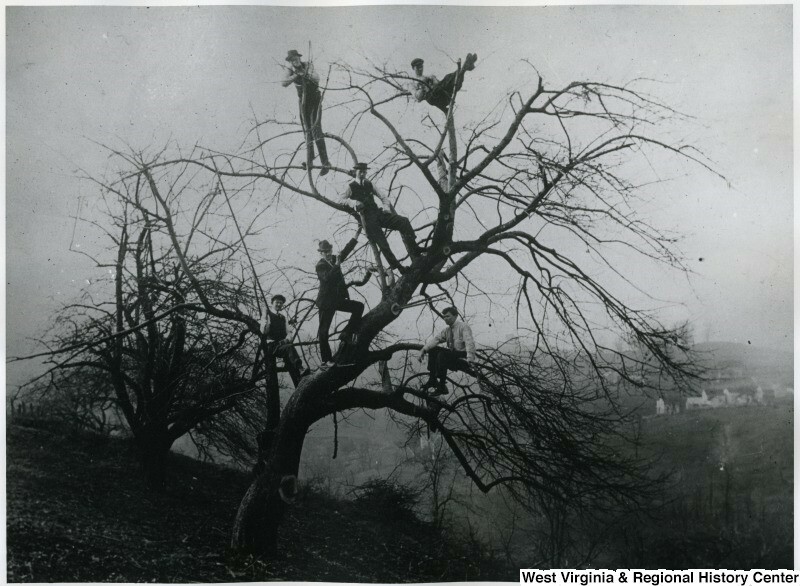 Pruning Apple Tree, West Virginia University: Not content to just study apples, Mountaineers grow them. WVU continues to grow apples at its Kearneysville Tree Fruit Research & Education Center, and sells the fruits of its labor every fall. While many folks across the state enjoy the fruits of the apple trees in their own yards, commercial apple production in WV has generally been most robust in the Eastern Panhandle. The map below shows that the Eastern Panhandle has been an apple orchard region since at least 1901, likely due to their great Shenandoah Valley climate. Apple Farmer, Martinsburg, W. Va.
“A million bushels of apples at Martinsburg, West Virginia, the apple center of the Eastern panhandle of West Virginia. For your enjoyment, I have collected a few apple-related recipes from our great selection of cookbooks in the WVRHC. Use 40 gallon copper kettle and wooden apple butter stirrer. Put cider into kettle and heat to boiling. Let cook until reduced to one half. Add 1/2 of the apples and cook until soft. Add remaining apples and cook until soft, stirring continuously. Add sugar. Cook slowly, stirring constantly to prevent burning. Cook approximately 3 hours after sugar has been added. Take out small portion in a saucer and cool. If it jells and is spreading consistency remove kettle from fire, add oil of cinnamon and mix thoroughly. (Apples and heat determine cooking time and this will vary.) Makes 12 gallons. Prepare enough jars ahead time to hold apple butter. Have jars hot Pour in apple butter. Let cool before covering. Winter was long for the early settlers. The women of the house tried all their cooking skills and came up with many ways of cooking the same foods to keep their family interested in eating and enjoying their meals. I imagine that is where this January Pudding was first mixed up and found to be very good. Peel, core, and chop the apples finely. Add the bread crumbs, sugar, salt, and spices. Beat the eggs well and use them to moisten the pudding. Blend in melted butter. Turn into a greased baking mold, cover closely and steam about 2 hours at 350 degrees. Serve with your favorite hot sweet sauce, or thick cream. Use 1 quart flour, 1 tablespoon lard, l tablespoon cow butter, 1 small spoonful of soda, dissolve in a small amount of hot water. Two small spoonsful of cream tartar, sift through flour, add enough milk to make a good dough. Roll the dough out to ¼-inch thick, cut into squares big enough to cover a good size apple, core the apple and put in center of square. Sprinkle apple with nutmeg or cloves and a little sugar. Bring the corners of the dough together and place each dumpling on a floured square of cloth, tie top and leave enough room for the dumpling to swell. Cook for about three quarters of an hour. Put a pinch of salt in the boiling water. My grandmother made these dumplings, the entire meal consisted of just the dumplings served with sugar and thick cream or sugar and sour cream. The dumplings were a real treat. Images from WV History OnView. Corbett, L. C. Apple Districts of West Virginia. 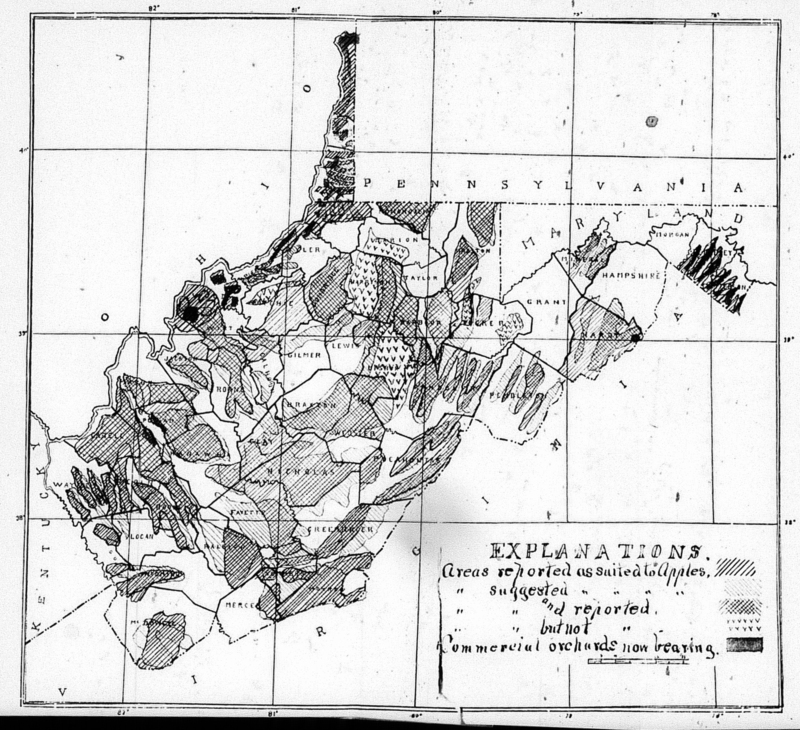 Morgantown, W.V., West Virginia University Agricultural Experiment Station Bulletin No. 75, 1901. Evans, Homer C, and W. S Hutson. Marketing Appalachian Apples. Morgantown, West Virginia University Agricultural Experiment Station Bulletin No. 372, 1955. Jack, Robert L, et al. 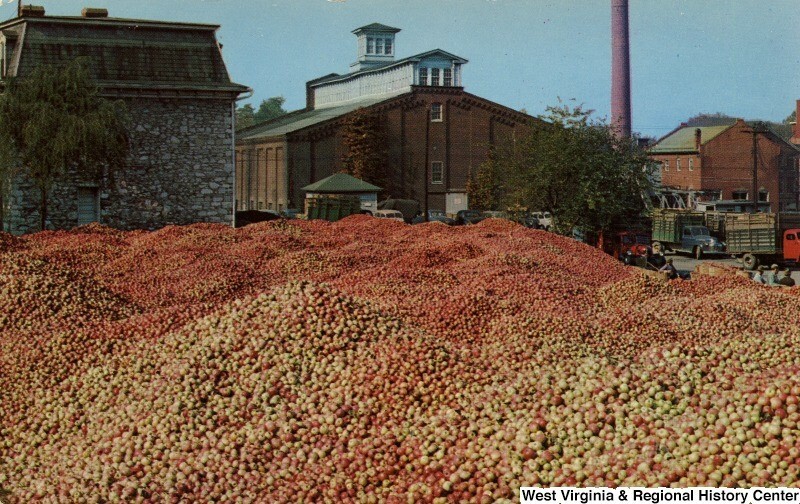 Fresh Apple Utilization in West Virginia. Morgantown, Division of Resource Management, West Virginia University, 1974. Lundy, Ronni. Victuals: An Appalachian Journey, with Recipes. New York, Clarkson Potter/, 2016. 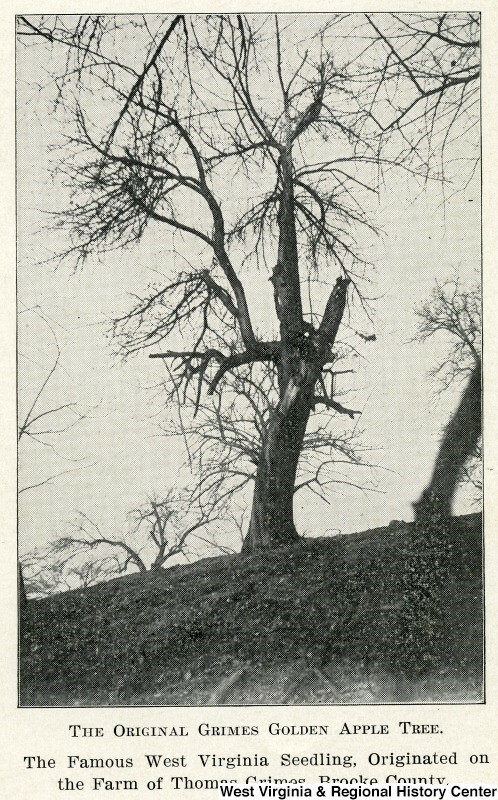 Sperow, Charles “Agriculture.” e-WV: The West Virginia Encyclopedia. 04 September 2012. Web. 28 November 2017. What a delightful, variously researched, informative article! –“A million bushels of apples”; “snits”; and “cow butter”; and 74 pounds per person (1912) down to 12 (1969). We need to get back to “an apple a day.” Sadly most(?) of WV’s orchards have disappeared since the apple industry has consolidated in Washington state?